CHARLESTOWN, Mass. – On Saturday, Oct. 14, 3,000 rubber ducks will be released into the Little Mystic Channel to race in the inaugural “e” inc. Duck Dash. Funds raised through the family friendly festival, which will include music, food, fair games and science activities, will go to support the second rotating exhibit, “Our House: Rethinking Home in a Changing Climate,” at the newly opened “e” inc. Environment Science Discovery & Action Museum. “e” inc. is the leading nonprofit bringing science and civics to youth and families in Metro Boston. The nonprofit’s Museum teaches visitors of all ages about the beings, biomes, resources and systems of our planet through a combination of hands-on experiences and traveling exhibits. “Our House” will offer children inspiration and ideas about how they can make changes to combat the challenges posed by climate change within their own homes and neighborhoods. The exhibit is slated to open in January, 2018. How it works: Rubber ducks are $10 each and must be purchased in advance. Each duck will have a corresponding number for participants to monitor their progress during the race. The first place winner will receive a $350 cash award. Other Duck Dashers will have the opportunity to win prizes donated from local and Boston-based businesses. “e” inc. will have fun fair games, science activities, and kite-making from recyclables. Amy Kucharik and the Second String Band will provide the music. Mediterranean cuisine from the Chubby Chickpea food truck will be available for purchase. The event goal is to raise $20,000. The inaugural “e” inc. 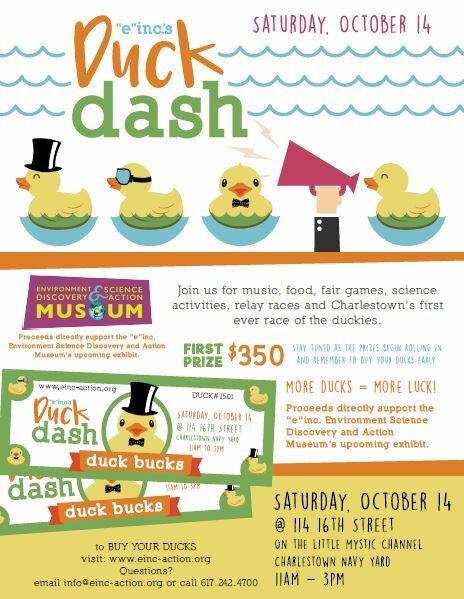 Duck Dash will take place on Saturday, Oct. 14 from 11 a.m. to 3 p.m. along the Little Mystic Channel in the Charlestown Navy Yard, located at 114 116th Street in Charlestown. The event will take place rain or shine (ducks love water)! For more information about the event and to purchase your lucky ducky, visit: http://www.eincmuseumtkts.org/duck-dash.